Located in the Monte de la Concepción, a Medieval Castle. Its origin dates back to the city. It is known as "Castle of the Ducks" after conditioning as Torres in the century. The materials from which the castle was built in large part come from other buildings that existed there in the days when the city was a Roman colony. In S. XIV was a reconstruction in which large blocks were used in the Roman amphitheater. 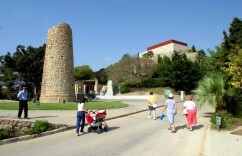 The latest restoration work in 1994 regained access to the historic Tower of Homage. 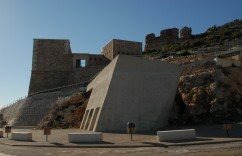 The castle was the target of surveillance and defense of the city and the bay. Located next to the Faro de Navidad on the right side of the Bay of Cartagena. It was built in the 1860s to defend the port, city and Arsenal's attack enemy fleets. Is set in one of the points that define the entrance to the port. The building is a neoclassical style. The beach of La Azohía, together with a well equipped tourist infrastructure, supports a traditional fishing hamlet. There they continue to use - from March to July - the "almadraba", a fishing technique of Moorish origin used to catch tuna. 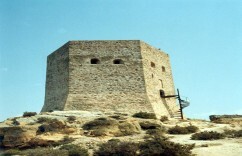 One of its points of greatest interest is the so-called Torre de Santa Elena; hexagonal in shape with two wings, its construction dates back to at least the final years of the 16th century, under the reign of Felipe II, and built with the object of providing protection to the fishermen of La Azohía and to serve as a watchtower to guard against the presence of pirates on their coasts.